His smackdown of the tweeting cowards was long overdue…if not from him, then from SOMEBODY. And therein lies a lesson. We need more Curt Schillings, people who don’t just sit there, but who fight back. Hard. He forced the dirtbags to face the music for their anonymous, bullying, perverted tweets aimed at his daughter. That’s what it’s going to take to win the “war” against bullying. That’s also what it’s going to take if decency and civility are to overcome just about anything that is not right about the world we live in today. Civilized American society took over from there and smacked ‘em. Ticket guy is fired, the other guy is suspended. One for the good guys. In the aftermath, Schilling explained that he grew up in the raucous, off-color culture of the locker room. He knows salty language. He knows bravado. He knows macho. This, he said, was different. Pick your favorite team sport. Why does Team A defeat Team B? Was it because of the master game plan, the scouting charts, the coach’s pep talk? No. Team A won because more of their players won more of the hundreds – no, the thousands – of solo battles that add up to victory. The defender dashes to the spot and gets his hands on the ball a fraction of a second before the receiver gets there. Malcolm Butler. Dave Roberts makes it to second base just in time. The runner sprints to the base and slides in head first, his hand touching the bag just before the shortstop’s glove touches the hand. Dave Roberts. The pass catcher holds onto the ball that’s pinned to the crown of his helmet, and keeps the touchdown drive alive. David Tyree. The backchecker who bulls his man off the puck and spoils the odd-man rush; the rebounder who leaps just a little higher than the other guy; that batter who fouls off ten pitches, then draws a walk. Those are the battles that win sporting contests. There other arenas, other contests, in which we all should take our cue from Curt Schilling and fight back. Rules of conduct and stated principles are nice, just like scouting reports and game plans. Speeches and policies and pronouncements don’t hurt. But in the end, they don’t help much either. We have to go one-on-one with the enemy. 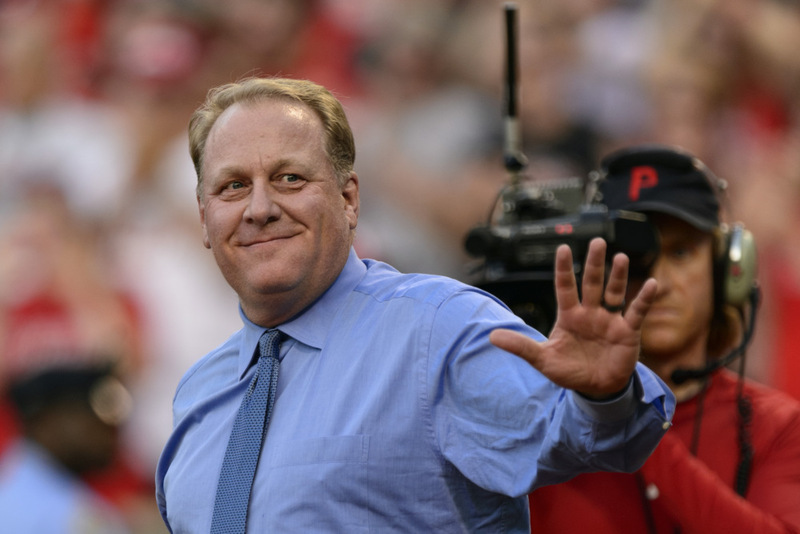 Was Curt Schilling’s outing of the bullies an assault on free speech and “fairness?” After all, doesn’t everyone have a right to speak his mind? That’s all that those young males were doing. Amid the cheers of approval and the compliments, there were more than a few who said that Schilling had no business bragging on line about his daughter’s achievement, and that what happened to those poor lads was wrong. In other words, that Curt too was a bad guy and a bully himself. So, in like manner, are you a racist if you criticize the policies and actions of an elected political leader whose skin color is different from yours? Are you a sexist if you oppose the presidential ambitions of someone whose gender differs from yours? Are you a homophobe if you believe that the hate campaign leading to the legal ruination of florist Barronelle Stutzman is a disgrace? Are you an evil despoiler of the environment if you are skeptical of doctored data that purportedly shows that mankind is responsible for global warming? Or is it global cooling? Or is it climate change? The answers are No, No, No, and No. But how many Americans who realize this would still speak their minds, would still battle back, as did Curt Schilling? Or, to ask the same question another way, how many Americans just don’t bother speaking up as he did because they don’t want to endure a barrage of ad hominem, politically correct opprobrium? In the latter case, I daresay it’s too many. That’s why I say we need more Curt Schillings. We need more people to do their jobs. There’s still a never-ending battle for truth, justice and the American way. And it’s not for Superman to fight. It’s for all of us. In the manner of Curt Schilling vs the tweeting bullies. 1.) He’s not been afraid to speak his mind in the sporting arena either. If memory serves, he was one of the few players who said, in effect. “Good riddance” when the Red Sox traded Nomar Garciaparra in August 2004. Schilling ticked off a lot of fans and writers, but was absolutely right. Getting rid of Nomar was addition by subtraction. Remember what happened with the Red Sox in October 2004. No coincidence. 2.) I had the opportunity to meet and talk briefly with Shonda Schilling one day. It was at an event where she spoke about Curt’s and her book, “The Best Kind of Different.” The love and devotion that she – and undoubtedly he as well – have for kids with Asperger’s Syndrome and similar conditions were abundantly clear and obvious to me. This is not a celebrity couple espousing a cause du jour. Rather, they’re fully and sincerely committed to the cause of helping such children and their families. 3.) After he retired from baseball, Curt Schilling took a fling at private business. His 38 Studios failed, and failed spectacularly. Yes, he got help and breaks from the states of Massachusetts and Rhode Island. But he also put up and lost a tremendous amount of his own capital. It was no Solyndra-type fraud on taxpayers by the politically connected. Curt Schilling was all-in for the venture, and he faced up to the consequences when it tanked. It was once rumored that Curt Schilling was thinking about running for the United States Senate. I’m sorry that he didn’t. He would be a superb representative for the citizens of Massachusetts. You are currently browsing the Veteranscribe's Blog blog archives for March, 2015.